He has written a lot of books and scholarly articles, written and hosted television shows, produced an award winning movie, and has even won Emmy awards. And what is his greatest calling? To promote the Kingdom of God on this earth by demonstrating how science supports Biblical Truth. This man came to faith through an intentional act of reading the Bible through the lens of science and found them to be in complete agreement. Michael was always drawn to the beauty and order of the universe, and began his search for Truth, in part, because he found the commonly held assumption that the existence of the universe is ‘one big happy accident’ to be intellectually unsatisfying. Michael is convinced that absolute and objective truth exists and is passionate to let others know that the Bible and science back each other up on this point. The Bible declares the existence of a vast unseen world of other realms. Now, science has demonstrated that at least 95% of the universe cannot be seen (think dark energy, black holes, parallel universes). Did you know that instantaneous communication happens and can be replicated? Doesn’t this align with what we read in scripture about God communicating with us? Or consider the following two verses about God: “God is light; in him there is no darkness at all,” (1 John 1:5) and, “The Word became flesh and dwelt among us” (John 1:14). Now consider another two facts: time does not exist in pure light and light can become matter (and vice versa)! Do these scientific truths support that God, who is light, exists outside of time or that the light of the world could become flesh? Jesus, the light of the world, is fully God and fully man…mind boggling! These are just some of ten selected scientific truths that Michael explains for the rest of us (thankfully, in layman’s terms) and then supports with scripture in one of his recent books, Amazing Truths: How Science and the Bible Agree. 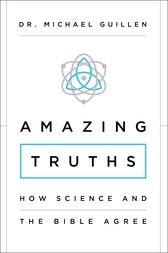 I gave a copy of Amazing Truths to my Father-in-law for Father’s Day this year. He is also a very smart man, with Religion and Philosophy degrees from Princeton. He loves to question things. He had read the book in its entirety and written me a thank you note before I could even drive home from our visit in North Carolina this past summer! He called Amazing Truths a “rare book” and declared that Dr. Guillen’s “reconciliation of science and scripture is the finest I have ever read.” I would agree. Dr. Michael Guillen will be coming to Charleston this October for two speaking engagements. He will be interviewed at the Charleston Library Society about his newest book and first fictional work, The Null Prophecy, on Friday, October 27, and will be speaking at The Gathering for Life Resources on Sunday evening, October 29.